It’s almost sewing time! You’ve learned how to wind and insert the bobbin. Now, you need to learn how to thread your sewing machine. Because there are so many different sewing machines, it’s impossible to share with you specific details about how to thread your make and model of machine. 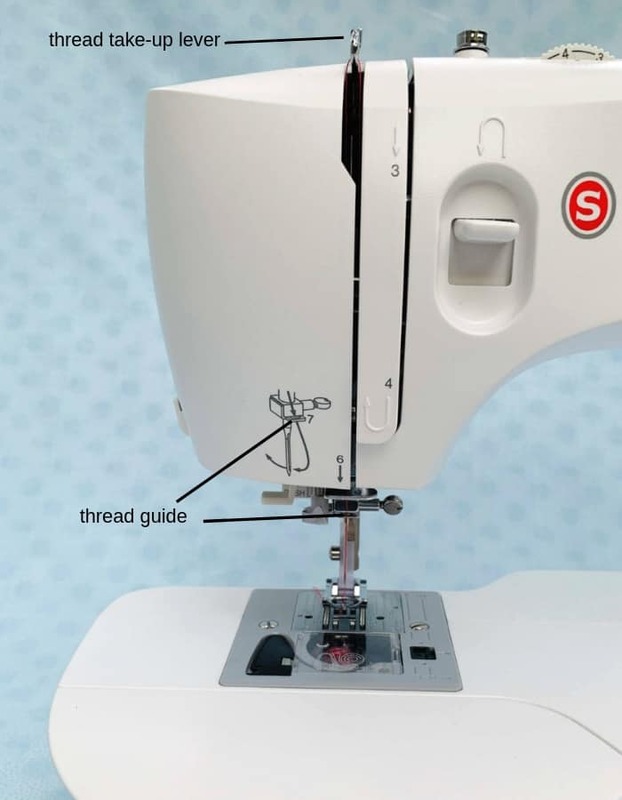 The goal of this post is to provide a framework so you can learn how to thread the lower and upper threads on your sewing machine regardless of brand or model. On most household sewing machines there are two threads that work together to form stitches. There’s the thread from the spool on the top of the machine. This thread goes through the eye of the needle. There’s also the thread from the bobbin. It’s located at the bottom of the sewing machine. This thread comes up through the needle plate. Thread from the spool goes through the needle’s eye. Thread from the bobbin comes up through the needle plate. Get your sewing machine out and set it on the table in front of you. You need a bobbin** wound with light colored thread. 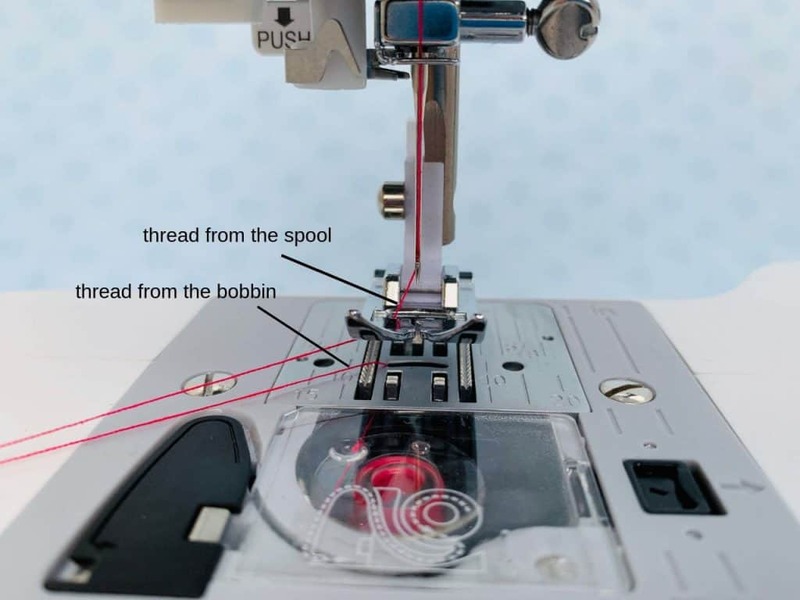 If the bobbin isn’t already in your machine, take a few minutes to look at how to insert a bobbin. You also need the spool of thread that’s the same color as the bobbin thread and a pair of scissors. *Note: If you don’t have an instruction manual, more than likely you will be able to find it online. To do this you will need to search using the brand/manufacturer and model of the machine. You can contact the manufacturer of the sewing machine directly or search online for a third party distributor of sewing machine manuals. Depending on the sewing machine, the manual may be free or you might have to pay a small fee. Regardless, if the machine you will be sewing with doesn’t have an instruction manual, you will be saving yourself a lot of frustration if you take steps now to get one. **IMPORTANT: Bobbins are NOT one-size-fits-all. They’re not universal. This means every sewing machine requires a specific type of bobbin. You need to make sure the bobbin you’re using was made for your machine. Otherwise, your stitches won’t come out right and sewing won’t be any fun. To thread the top thread of your sewing machine, you’ll need the spool of light colored thread. Open the instruction manual that goes with your machine so you’re looking at the illustration(s) or the photograph(s) where the main parts of your sewing machine are labeled. 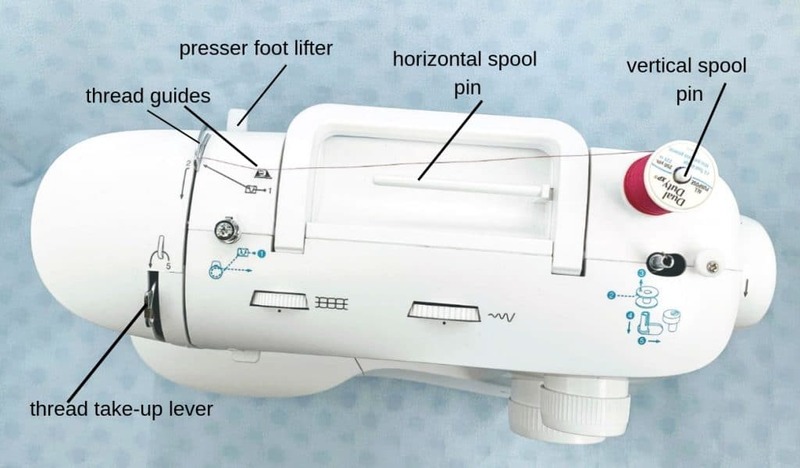 For most sewing machines, you’ll use parts in these areas to thread your sewing machine. Turn off the power to the sewing machine. Raise the needle to the highest position by turning the handwheel toward you. Move the thread over the top of the machine through the thread guide(s). Bring the thread down, up through the eye of the take-up lever, and then down again passing it through the thread guide near the top of the needle. Pull at least 4-5 inches of thread through the needle. It should move smoothly with little resistance. The numbers and arrows on my Singer sewing machine in the pictures above will give you an idea of the type of path thread takes from the top spool to the needle. For the exact steps to thread the top spool on your sewing machine, look at the directions provided in the instruction manual. After you get the top thread prepared and through the eye of the needle, you need to draw the bobbin thread up through the needle plate. The steps are similar whether your bobbin is front-loading or top-loading. Safety: The needle is sharp. Be careful not to prick your fingers. With your left hand, hold the top thread tail that has been threaded through the needle to the back and left of the presser foot. Turn the handwheel toward you one full turn to lower and raise the needle. Pull up on the thread you’re holding in your left hand so the lower thread is pulled up through the hole in the needle plate. You may need to carefully swipe closed scissors blades under the presser foot to move the bobbin thread out from underneath it. Grasp the end of the bobbin thread and pull it toward the back of the machine. You should have 4-5 inches on both the upper and bobbin threads. Look at the directions provided in the instruction manual for the exact steps on how to draw up the bobbin thread on your sewing machine. Yep, that’s right. Practice threading your machine. I strongly suggest you practice threading and rethreading both the top and bobbin threads many times right now. As you sew you’ll find yourself needing to change or rethread both the bobbin and spool. A few reasons for this include thread breaking, spools and bobbins running out, and changing colors of thread. Sewing is a lot more fun when you can quickly reload a bobbin and rethread the machine. Storytime: After sewing on the same machine for almost 25 years, a small metal wire that guided the thread fell off when I was in the middle of quilting a lap quilt. The metal piece was part of the threading system for the top thread. I tried to keep sewing but the machine kept skipping stitches. Thankfully, my mother lives across the street. She owns several machines and let me borrow one. It was similar to my machine but a different brand. Little did I know, the knowledge and experience with my sewing machine only took me so far when I sat down in front of my mother’s machine to finish the quilt. Her machine, though similar to mine, was set up differently and had some additional features. On my machine, I could prepare the bobbin and thread the machine in less than a minute. I didn’t even have to think about what I was doing. With my mother’s machine, I had to look up how to wind the bobbin. Thank goodness, the bobbin was front-loading like my machine so I didn’t have to figure out how to insert the bobbin. Mom’s machine has a horizontal spool pin (my machine has a vertical one) and the path the thread needed to take wasn’t clear to me. Using the manual illustrations and trial and error, it took me over 20 minutes to get the top thread through the machine correctly. Needless to say, I was frustrated and not very happy. But at least I was finally ready to quilt again! Not too long after I started quilting, the top spool ran out. This meant I needed to rethread the machine. It didn’t take quite as long the second time to thread the machine, but it took longer than I wanted it to. A few days later, I wanted to work on a different project and needed to thread the machine with another color. I couldn’t remember how to thread Mom’s machine! So, I had to get the instructional manual out and refresh my memory. Thankfully, I was able to thread it faster than the first two times I tried, but I was nowhere near as fast as I had been on my own machine. I don’t want you to feel the frustration I felt. When you’re ready to sit down and sew, you don’t want to spend a lot of time looking up how to thread the sewing machine. Eventually, threading your machine will become something you’ll be able to do automatically. 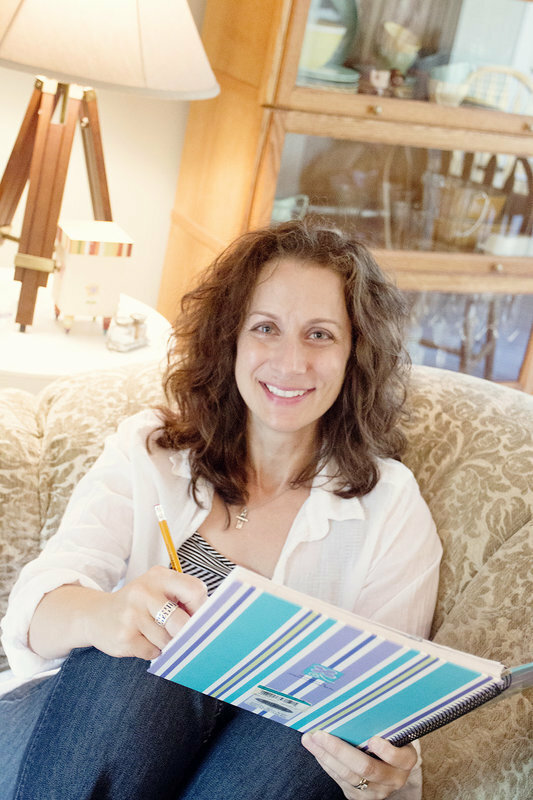 Until then, you want to start building muscle memory and begin the process of speeding up your threading abilities before you start learning specific sewing skills. You do this by practicing. Start with inserting the bobbin. Do this enough times that you can do it without looking at the manual or quick start guide. Once you feel comfortable inserting the bobbin in the machine, thread and rethread the top spool. When you remove the top thread from the machine, cut the thread at the top, grasp the end near the needle, and pull it through the machine. This helps keep thread fibers out of the inside of the sewing machine. Top picture: Cut the thread at the top. Bottom picture: Pull the thread from the bottom. Thread and rethread the top spool until you are relying on the manual/quick start guide less and less. Load the bobbin and rethread the machine at least 5 times or until you feel like you know what to do without looking at the manual. Are you competitive? Time yourself each time so you can see your improvement. Make sure to practice drawing the bobbin thread through the needle plate, too. You now have foundational knowledge about the top and bobbin threads on a sewing machine. 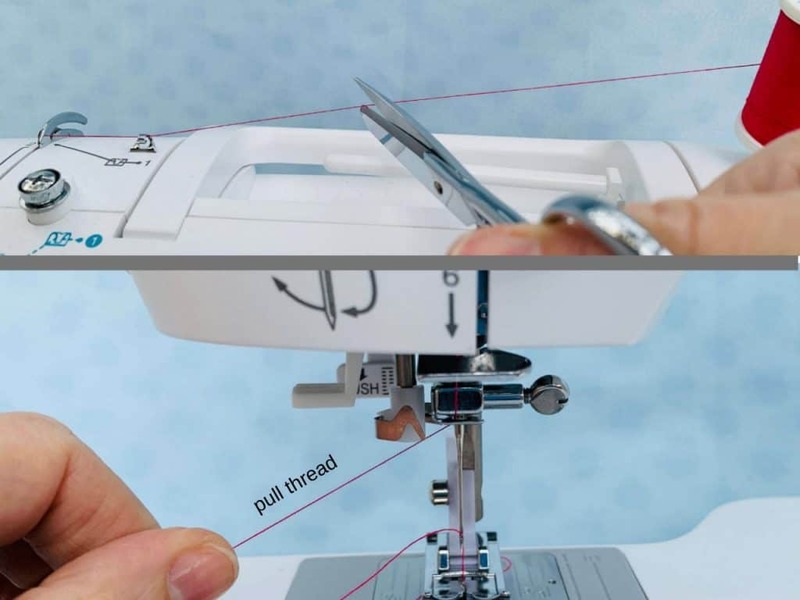 Using the instructional manual for your sewing machine and the general guidelines I provided, you’ve successfully threaded your machine and drawn the bobbin thread through the needle plate. 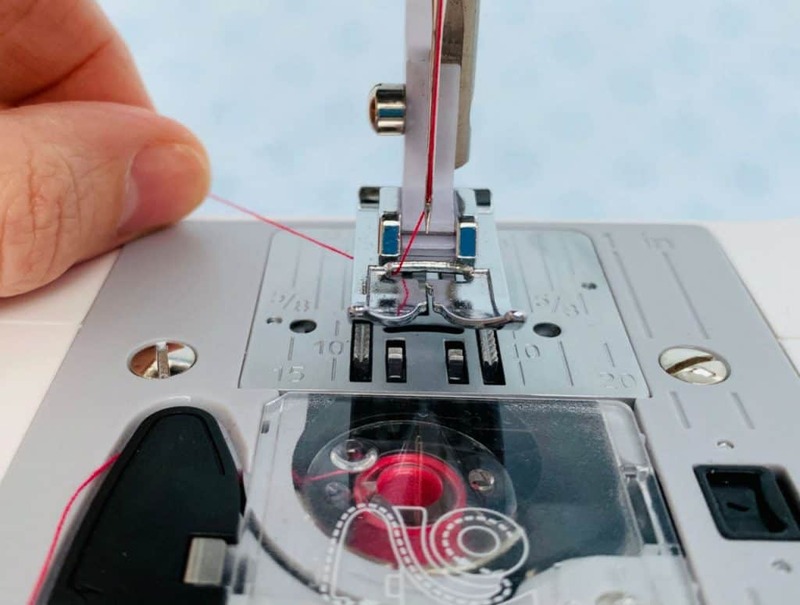 You’ve also built muscle memory by practicing inserting the bobbin into the machine, threading the top thread, and pulling the bobbin thread up through the needle plate. 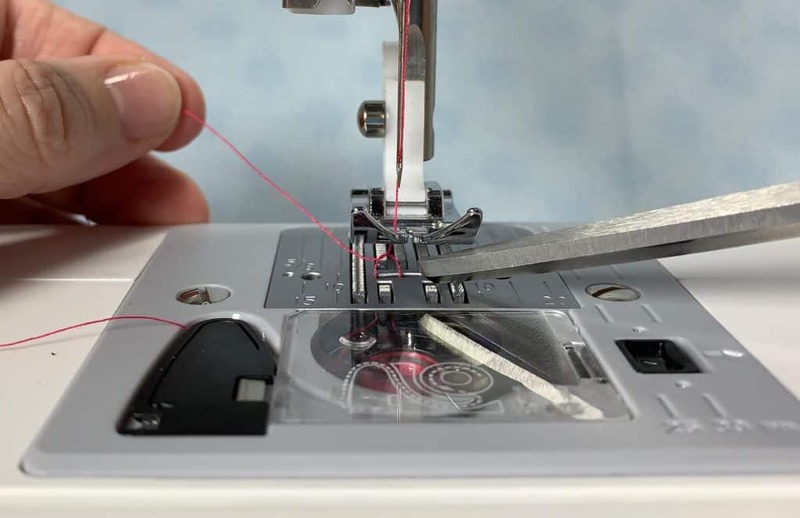 The next time you need to thread your machine, you’ll be able to do it quickly and with confidence. Let’s build a little more foundational understanding and turn our focus to stitch length and width. After that, it will be time to sew some stitches!